We took in more spectacular scenery along the winding coast as we made our way further north to the spectacular seaside resort of Calvi, our final destination on this Corsican vacation. Calvi is a Riviera-style resort with a lively promenade full of colorful cafés & restaurants, a lovely yacht harbor, a 2-mile stretch of white sandy beach with shallow transparent water that slowly eases out toward the impressive 15th-century Genovese citadel sitting in all its glory high on its rocky promontory. 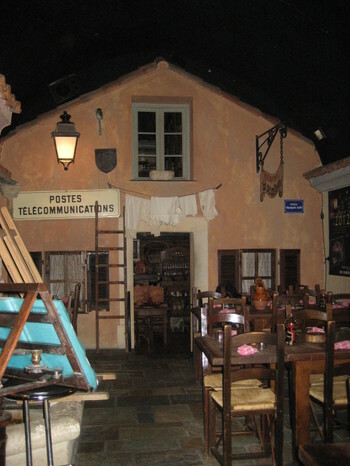 While Ajaccio boasts of being the birthplace of Napoléon Bonaparte, Calvi boasts of its own native son, Christopher Columbus, who was, by their account, born in a house right in the interior of the citadel in the year 1436. They have a lovely square named after him, Place Christophe Colomb, and they hold a festival in his honor each October. There seems to be no doubt that Christopher Columbus was Genovese, and Corsica was ruled by the Genovese for six centuries, so who knows… However, I think they should have to “duke it out” with Genova, Italy for this particular distinction. After a short drive north to L’Île Rousse for lunch at one of the beach restaurants, we returned to Calvi and spent the afternoon swimming and admiring the amazing scenery all around us. We got our exercise by strolling along the Quai Landry under the palm trees, and by meandering through the steep, narrow, cobbled streets of the citadel. We had a great dinner at a restaurant called EAT, which sat just at the foot of the citadel. The fusion of Asian and French cuisines was excellent on this warm night under the stars on the quiet terrace. 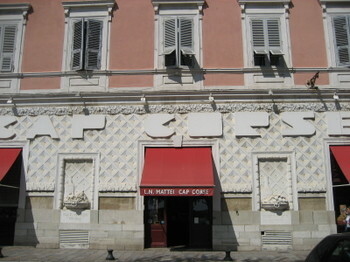 EAT (Epicurien Avant Tout), 15, rue Clémenceau, 20260 Calvi, tél: 04.95.38.21.87. The picturesque bay of L’Île Rousse is surrounded by red granite rocks which serve as a base for a lighthouse built in 1857 and another Genovese watchtower. 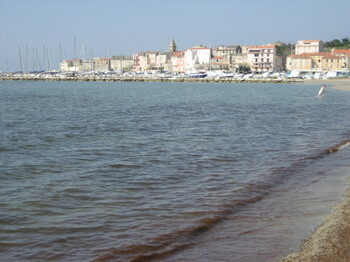 Once again, time is short, and all we were able to do is have lunch and a short stroll along the seaside promenade here in L’Île Rousse, but I wouldn’t mind spending a little more time here and maybe participating in some water sports the next time around. A dip in the sea was our first order of business when we arrived into the picturesque village of Porto yesterday afternoon. We felt safe from ne’er-do-wells, thanks to the protection of the 1549 quadrangular Genovese watchtower overlooking the sheltered Golfe de Porto. Porto’s Marina is situated in a small estuary populated with sports and fishing boats, and can be reached by a small colorful footbridge. Apparently, the Marina provides the departure point for nautical excursions into the Golfe de Porto and to the Réserve Naturelle de Scandola, but, unfortunately, we won’t be around long to take advantage of it. I guess that will be a good excuse for a return trip to the area. Our first stop this morning was a hike around the Tour de la Perata, the Genovese watchtower sitting atop the black granite headland known as the Pointe de la Perata. 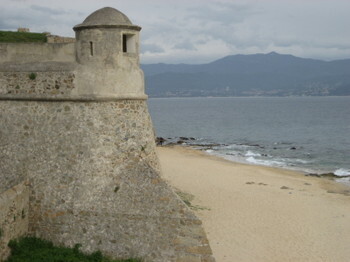 This tower was built in 1608, around which time over 60 such towers, both square and round, were built around the perimeter of the island of Corsica by the Genovese to keep a watch out for invading pirates and other bad guys. They are mostly all still standing in one form or another, some in much better shape than others, and some in nothing more than ruins. Apparently, there are some nice hikes starting from this point, but we just toured around the tower and took in the views of the sea and the beautiful Îles Sanguinaires before continuing on our way. Our drive along the northwest part of the island today took us through the beautiful, colorful granite rock formations of the Calanques de Piana. The interesting formations and all the nooks and crannies, known as tafoni, are the result of the effects of water and sweeping winds over all these years. Some of our stops today included a swim and a picnic on the beach, a photo op for a large flock of goats crossing the street, short visits to the villages of Cargèse and Piana, and several breaks for taking in the beautiful views all along the way. After a relaxing beach day yesterday at the nearby Plage Palombaggia, and hanging out in lively Porto-Vecchio for one more day and night, we headed out this morning with a goal of seeing the west coast of Corsica, just north of the historical city of Ajaccio, which we spent some time visiting on our last trip to the island. Our first stop was in familiar territory in beautiful Bonifacio, where we stopped for an alfresco lunch at a restaurant called Vista Da Rocca, overlooking the bright white cliffs and the recognizable Grain de Sable against the azure Mediterranean Sea. After lunch we took an impromptu dip into the irresistible crystalline water before heading back to our car by way of the colorful harbor, where, much to our surprise, we spotted Paradigm ! We made it to our hotel on the route des îles Sanguinaires in plenty of time to explore the beach, take a short swim, and to watch the sunset over the rocky red islands, the largest of which (the Grande Sanguinaire) is home to an 1840 lighthouse and the ruins of a Genovese tower. Labor Day weekend found us making a return trip to Corsica. 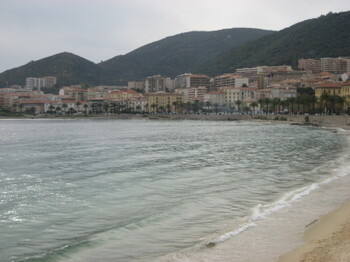 A four-hour ferry trip, with our car in tow, got us into Ajaccio around 11:30am. Our first order of business was to deliver my cousin, Rick, and his lovely wife, Joslyn, to Porto Vecchio to meet up with Joslyn’s sister and brother-in-law, Arline and Ted, for a week-long tour around the island aboard their amazing 115-foot Benetti-built luxury yacht, named Paradigm. In addition to the four of them, and the captain and crew of 6, they will be joined by two other lucky couples. Since they were not planning to meet up until tomorrow, we were able to take our time getting to Porto Vecchio, with plenty of stops for swimming, picnicking, and sight-seeing on the way. 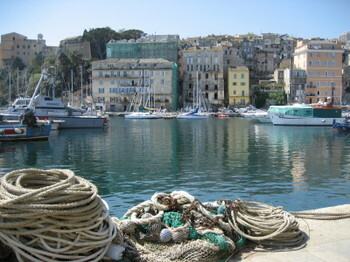 After we settled into the Hôtel Alcyon, we spent some time wandering around the colorful streets of Old Porto Vecchio. We came across the Bastion di A Funtana Vechju, which houses an art gallery with lovely views overlooking the harbor, and here is where we got our first glimpse of Paradigm, the largest boat in the port. We decided to head down to the port to say hello to Arline and Ted. They were gracious enough to invite us aboard for wine, hors d’oeuvres, and a private tour of their amazing yacht. Dave and I were exceptionally nice and polite – we tried not to be ourselves – just in case one of the other couples had to cancel out for their week-long cruise, and they might need us to substitute for them. Alas, our good manners went for naught, but we still really enjoyed hanging out like the rich and famous for a short while. 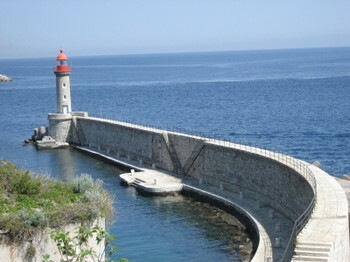 It didn’t take long to get from Corte to Bastia yesterday morning. 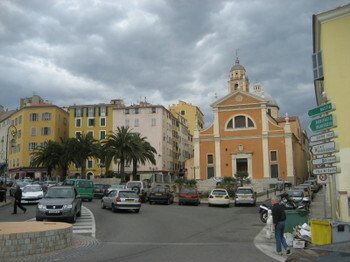 The second largest city on the island, Bastia sits at the base of Corsica’s panhandle, known as Cap Corse. Our first stop, even before finding a hotel for the night, was located at Place St-Nicolas, the large square in the centre ville, lined with shady plane trees and terrace bars and cafés. Our destination was Maison Mattei, fabricator of the well-known Corsican apéritif called Cap Corse Mattei, which is very distinguishable in its bottle shaped like the island of Corsica, with the neck of the bottle representing Cap Corse. 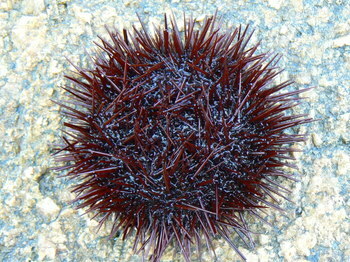 It is made from a base of red wine (actually unfermented grape must), and draws its distinctive bitter sweet taste from the addition of quinquina (quinine). Like wine, it is aged in oak barrels where it improves with time, and each time we had it on this trip, it was served to us in a small glass with a couple of ice cubes. 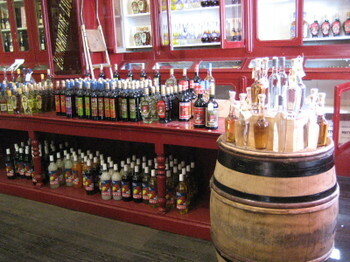 Fortunately for us, George & Joy offered to load our liquid purchases into their car for their ferry trip back to the continent on Saturday, since we had to fly back to Nice with all the new restrictions against carrying liquids on the plane. We covered a lot of territory on our last full day in Corsica, being chauffeured by George along the narrow, winding roads, high above the coast, taking in the vertiginous views of Cap Corse. 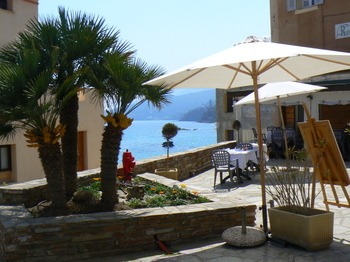 We saw a little of everything, but not too much of any one thing: lunch in charming Erbalunga, a walk on the beach at St-Florent, a cursory tour of Bastia. Because work beckons, and because the ferry schedule to Nice is not very frequent this time of year, Dave and I took a 40-minute flight home from Bastia very early this morning. 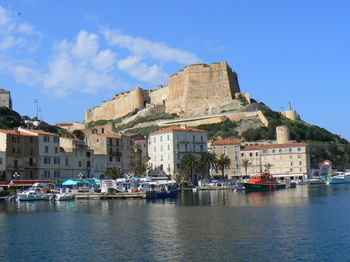 Joy and George will take the weekly ferry home on Saturday, which gives them a couple extra days to explore Calvi, and then head back to our arrival port in Ajaccio to take the ferry back to Nice. 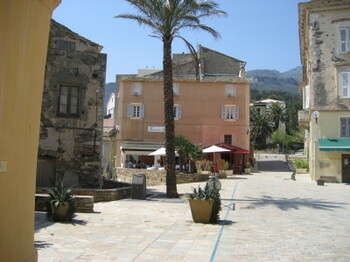 I guess Calvi will be another place for us to visit on our return trip to Corsica. 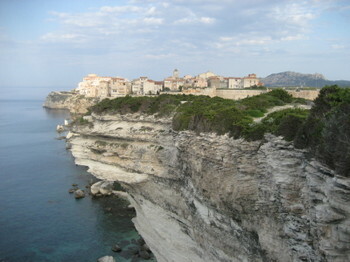 We made our way into the geographical and cultural heart of Corsica with our arrival into Corte yesterday afternoon. 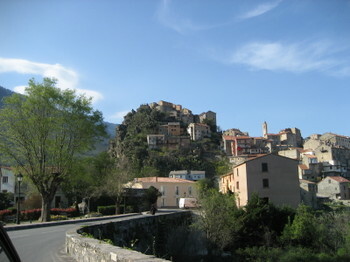 Because of its strategic location in the direct center of the island, Corte has always held a position of great importance in Corsica: it was once the capital of independent Corsica; it was the birthplace of the Corsican Constitution; and it is still home to the first university in Corsica, the University of Corte. After checking out the colorful Old Town and making a dinner reservation, we returned back down the road (D623) to see if we could get a couple of rooms at Hotel Dominique Colonna, which we found in our Michelin Guide. 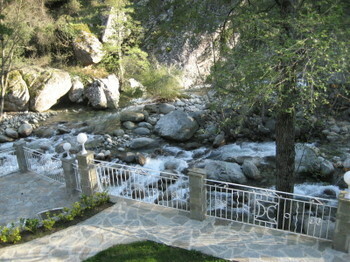 The hotel sits right at the entrance to the Gorges de la Restonica on D623, about 2 kilometers downhill from Corte. We were in luck. 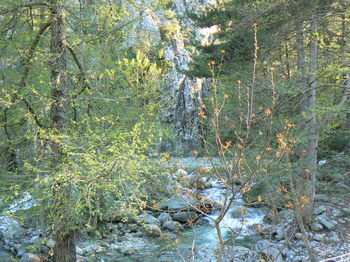 We both got rooms looking out over the rocky, babbling Torrent de la Restonica, which rushes down through the beautiful valley in the interior of Corsica. This morning Dave and I went for a short hike before breakfast to check out the beautiful terrain around us. We ran into about a half dozen wild pigs, just wandering around, apparently in search of some nourishment to start their day. 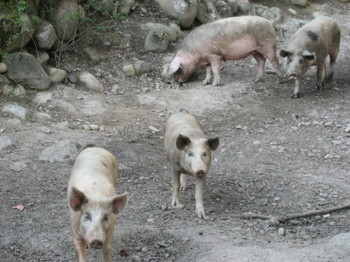 Dave had doubts that they were actually “wild” pigs, and I have to admit that they didn’t act too wild, but they seemed to be wandering about in the wilderness, and they looked like the pictures of wild pigs I had seen in books about this region. 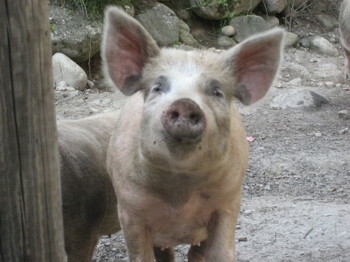 In any case, I prefer to believe that they were wild pigs of Haute Corse. While we were wandering around this morning with the rugged mountains all around us, and the crystalline river rushing past us, we noticed lots of marked hiking trails that would have been great fun to explore. It was immediately clear to us that our one night in Corte was definitely not going to be enough time. Unfortunately, we have to return to the continent early tomorrow morning, so we will just have to plan on a return trip to this beautiful area, with our hiking boots in tow. 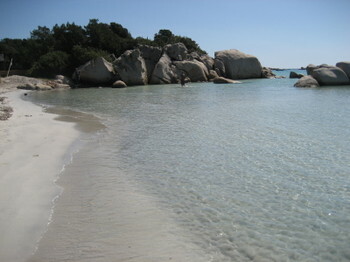 “A shell-shaped cove with brilliant turquoise water and white sand, the beach at Rondinara also has a camp site and a restaurant.”1 Both Joy and George voted the beach at Rondinara as their favorite. Although they were all beautiful, they felt that it was the most natural of the ones we had visited, with the hidden coves and fine sand. The fact that it took us a while to find it might have contributed to the feeling that it was somewhat remote. 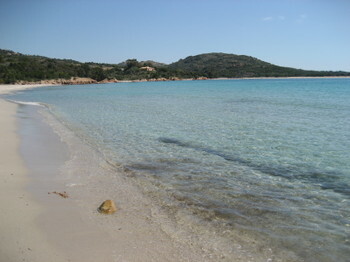 With two votes, Rondinara Beach was the overall winner today. 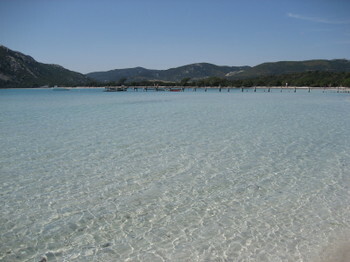 “The beach at Santa Giulia, a tranquil sandy bay bordered by dunes and pine trees, is equipped for all aquatic sports, such as windsurfing, canoeing and sailing.”1 The Santa Giulia beach got my vote for Best Beach because it was so picturesque with the crude wooden pier stretching out into the crystal-clear water, and it seemed like it would be the most fun. 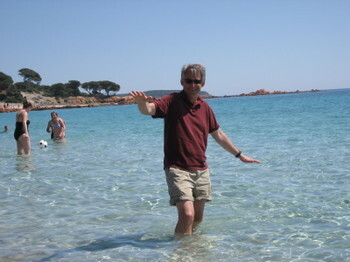 “With its white sand, pink cliffs, dunes, pines and a lovely blue sea, the beach at Palombaggia, south of Porto-Vecchio, is perhaps the most spectacular.”1 Dave’s favorite beach was Palombaggia because the beach was so long and wide and surrounded by colorful rocks. It probably didn’t hurt that this is where we had a great beach pique-nique with all the regular Corsican specialties: charcuterie, cheese, red wine, and chocolates. 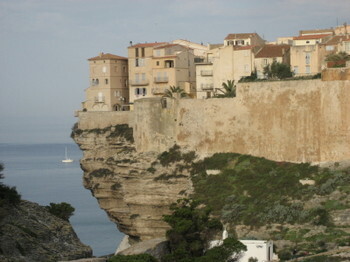 We arrived into Bonifacio yesterday afternoon and checked out a couple of hotels before deciding on a room with a view at Hotel La Caravelle, overlooking the picturesque natural harbor. 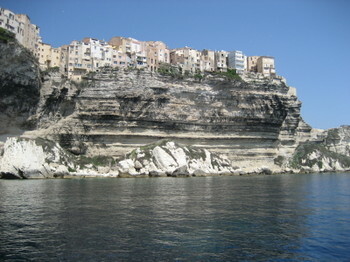 The town of Bonifacio sits on a craggy peninsula of limestone, with the Citadel and Old Town perched high above with the colorful marina on one side and the beautiful azure sea on the other side. This dramatic sight at the southernmost point of the island of Corsica is nothing short of spectacular, and it is only about 11 kilometers from the Italian island of Sardinia. The whole day today was filled with one stunning sight after another as we started the day with a challenging run up the steep cliffs in the early morning mist. 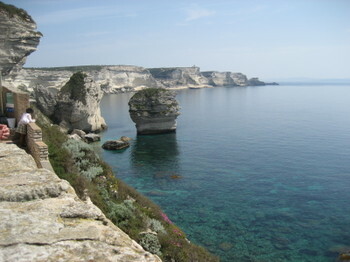 By the time we met up with Joy & George after breakfast, the mist had evaporated into the crystal-clear blue sky and brilliant sunshine, just in time for our cruise into the Straits of Bonifacio. 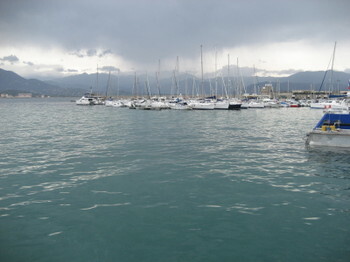 There were a number of boat trips available, with varying departure times and durations, which could be found down along the port. We scoped out the different trips and booked our seats about an hour before departure, which was no problem this time of year. Our small boat took us past the layered limestone cliffs, into the Lavezzi archipelago, a protected nature reserve of rocky islands with an abundance of interesting stone formations, flora, and cormorants & gulls. Our boat dropped us off on the uninhabited Île Lavezzi, where we had about an hour and a half to explore before continuing on. We started our island visit with a tour of the cemetery and monument commemorating the shipwreck victims of the Sémillante, which sank quickly in a violent storm as it was making its way to Crimea in 1855 with almost 700 French soldiers and crew aboard. 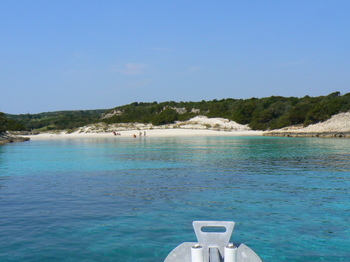 We then spent some time hiking around the island, checking out the different beaches until we found the perfect spot to sit, relax, and enjoy our pique-nique of local saucisson, cheese, and red wine, surrounded by the luminous, crystalline Mediterranean Sea. 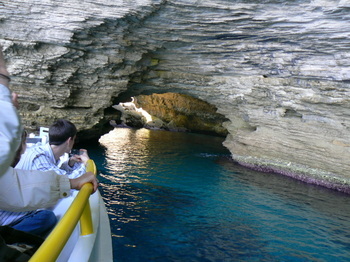 The return trip took us past other islands and beautiful beaches, and into a natural sea cave formed underneath the limestone cliffs. We hit the Sunday market in Ajaccio first thing this morning to stock up on provisions, just in case a pique-nique opportunity presents itself. We always like to be prepared. Then we set out in a southerly direction along the western coast to see what we could see. 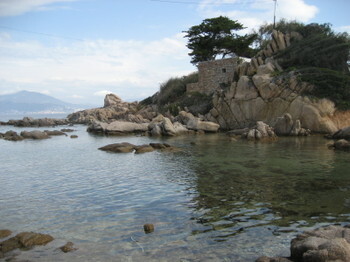 All along the Golfe d’Ajaccio, the water was clear and beautiful with windswept rocks scattered all around the sea and along the sandy beaches. 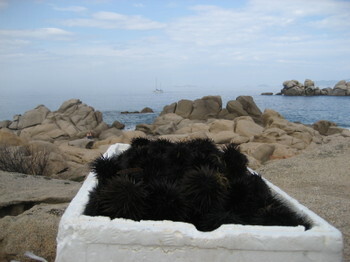 We came across a crate of oursins (sea urchins) on one of the beaches where we stopped, but whoever collected them didn’t take all of them. 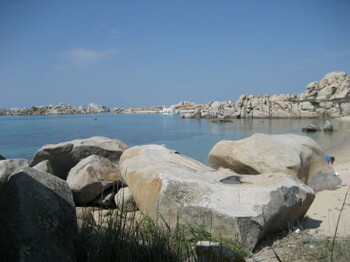 There were hundreds sitting in the sand in the clear shallow water between the rocks. After lunch in Propriano, we backtracked a bit, heading north and inland to check out the most well-known prehistoric site in Corsica. 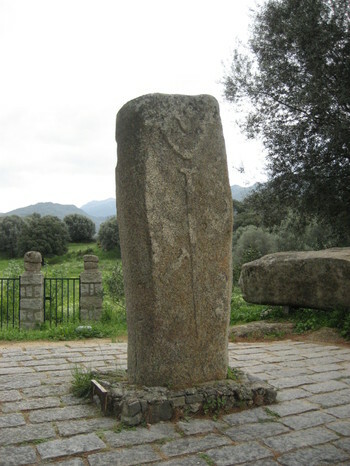 Filitosa was a small fortified town approximately 8,000 years ago, which was filled with anthropomorphic menhirs (upright megaliths) made from granite which was quarried locally in this valley of the Taravo River. The menhirs have clearly visible faces, with outlines of swords, shields, daggers, etc., on their bodies. They were also aligned in some purposeful order, the meaning of which is no longer known. 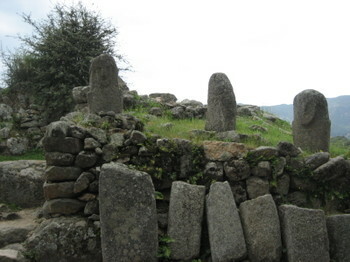 These vertical stone monuments were knocked down and many were destroyed long ago, probably because they were thought to be pagan symbols, and they were heaped into piles that were buried for centuries, along with the whole village of Filitosa. It wasn’t until the 1940s that, while clearing the area for his new venture, a wannabe horse-breeder named Charles-Antoine Césari accidently came across some menhirs and some remains of ancient buildings buried under the maquis (scrub brush) on his newly-purchased property. A systematic dig was completed by an archeologist named Roger Grosjean in 1954, unearthing some of the oldest megaliths in Europe. 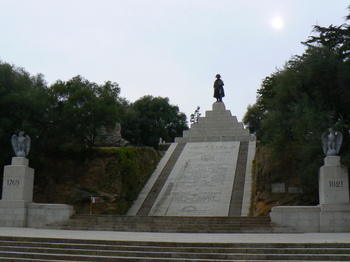 The statues have been resurrected and arranged, with their names reflecting the site where they were found. 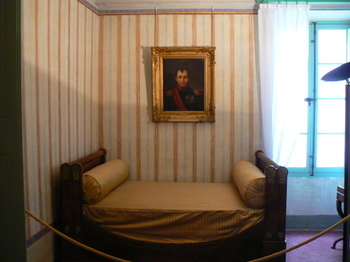 The site continues to be managed by the family of Charles-Antoine Césari.